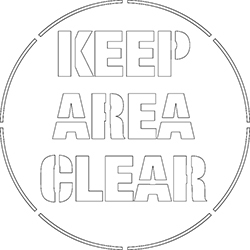 This is a great stencil that can be used to paint, “Keep Area Clear” on any flooring area. The stencil makes it very fast and easy to mark your floors in this way, which can help to save your facility a lot of time and money. In addition, it is one of the easiest options when it comes to improving your visual communication strategy within your facility. People have used stencils for applying floor paint for years, and it is a proven option that can work in almost any environment. Whether you’re looking to mark floors in your facility or outside, this is a great option. Letting people know that they need to keep an area clear is very important for any facility. Whether it is keeping an area around emergency equipment clear, or keeping doorways clear or just helping to keep the facility cleaner and better organized, this simple floor marking stencil is a great option to consider.